Alright. I’ve been terrible at keeping up on this blog. In the past 6 months a lot has happened that has kept me away. I got a full-time job, but more importantly, my yen yen’s health deteriorated. Unfortunately, she became very ill over the Christmas holidays with pneumonia and passed away in January at the age of 95, which brought on a whole other amazing experience of learning about the rights and rituals in Chinese culture, this time around death. I really wanted to document all the cultural things we did around my yenyen’s death to share, but I simply didn’t have the time or extra pair of hands to be doing much photographing. Though it may seem morbid to some people, these are traditions (like cooking and holiday celebrations) that are important in our culture. Also, I found the Chinese style funeral to be more interesting, engaging, meaningful and … dare I say… fun? Learning about traditions around death is also very important as we approach a time when our parents/grandparents approach ripe old ages and we all want to ensure that their last wishes are fulfilled. This is a much larger topic for discussion that I’ll leave for a future post as it is unlucky to be talking about death around Chinese New Year! Regardless of how life is going, I can always count on the annual Chinatown Parade to get me motivated and inspired to blog and connect with people again about learning the traditions of our elders. The Chinatown parade has become one of my favourite events of the year. This year, 50,000 Vancouverites spent their Sunday afternoon welcoming the Year of the Snake, and like last year, I walked with my fellow Hoy Ping Benevolent Association members. I’m always so proud of all the youth-based Athletic Clubs which somehow remain strong in every Chinese benevolent association. The youth train all year round to perform the lion dance, hoisting giant lion heads and crouching low to the ground. At the Chinatown Parade, I’m always impressed with how great they are at entertaining the crowd, especially the kids and elders who stretch their arms out for a chance to stroke the lion for good luck. Here are some pics of the parade from where I was …. 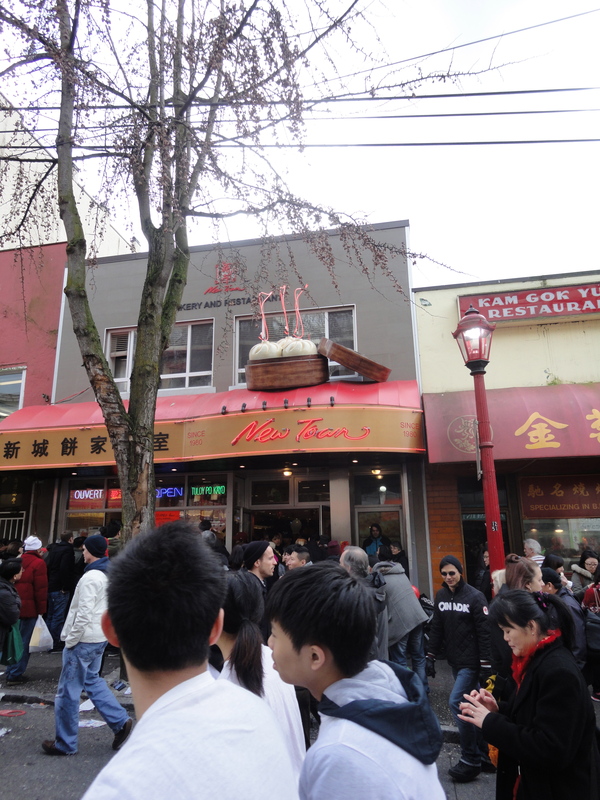 Following the 2.5 hour parade, attendees crowded the restaurants of Chinatown. Needless to say, Newtown Bakery, a cornerstone of Chinatown was packed full of people waiting to get their steamed buns! Once people finished filling up on steamed buns and congee, the second round of festivities began. Many of the lions were lured back out by the lettuce hanging above the doorways of businesses in Chinatown and in return the lions dance to bring good fortune to the business, while firecrackers, drums, cymbals and gongs could be heard loudly throughout the neighbourhood to help chase away evil spirits. Again, these impressive performances drew big crowds and lots of camera flashes. There were many other festivities happening in Chinatown that I didn’t get to either because it was too crowded or because of time, most notably being the Sun Yet San Garden. Nonetheless, there is still plenty of time to catch a glimpse of the giant living (literally!) snake sculpture in the Garden’s pond until the end of April. Fresh Choice Kitchens, Community Kitchen and Zhong zi time! I know I’ve been neglecting the blogosphere for a long time, but after feeling better from some health concerns that bogged me down, I’m thankfully full of motivation again and back in business! 🙂 And a lot of business I did indeed! Aside from healing, here’s what I’ve been up to lately. Recently I discovered a great local organization in our backyard run by the Greater Vancouver Food Bank, called Fresh Choice Kitchens. Fresh Choice Kitchens is a resource and advocate for EVERYTHING community kitchen related. They run the Downtown Eastside Community Kitchen (DECK) program, provide a wealth of information and workshops on starting and running your own community kitchen and (happily!) share their knowledge and experiences in running community kitchens. I went to participate in the Community Kitchen Roundtable, where community kitchen leaders in Vancouver and beyond meet and share successes and challenges to their programs. If you’re not involved in a community kitchen program, but are thinking about starting one, I highly recommend the Community Kitchen Leadership Workshop. I had a blast hearing about others’ aspirations and experiences, and cooking together. Everyone was so supportive of my idea to start an Intergenerational Chinese Community Kitchen in Chinatown that it left me feeling motivated and inspired! Which leads me to the second topic at hand. This past month I have been visiting the Strathcona Community Centre a lot and seen the many seniors programs held at the centre, particularly for Chinese seniors, who comprise of much of the surrounding neighbourhood. Naturally, I spread my community kitchen idea to the many seniors at the centre to see what they think, and they too are keen to pass down their culinary knowledge to young people. So, this summer, we’re starting a pilot program of the Intergenerational Chinese Community Kitchen! If you, like me, are a CBC (Chinese Born Canadian) who grew up eating Chinese food, but now have fears that you will never be able to eat those foods again, you’re the perfect candidate! 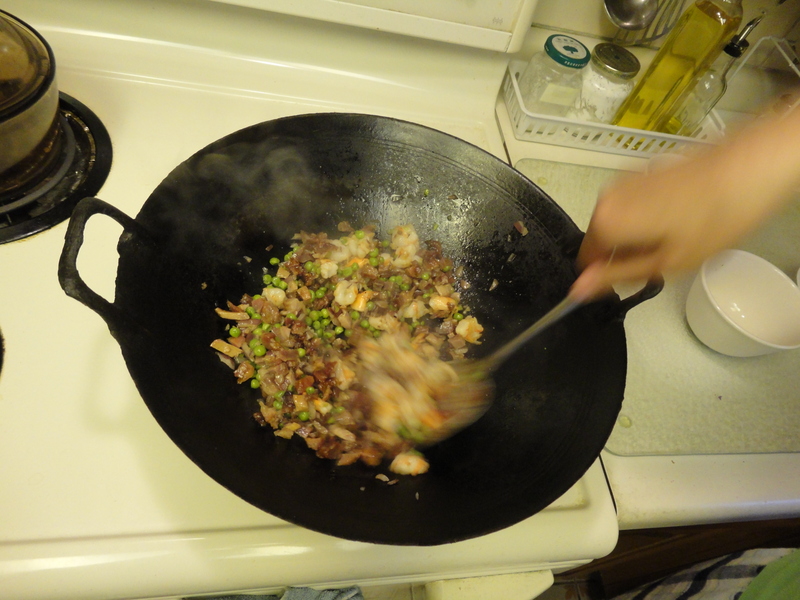 If you just want to learn how to cook traditional Chinese food, you’re welcome to join us too! What do you want to learn how to cook? What did you grow up eating? Let me know and we’ll have a knowledgeable Chinese senior teach you. 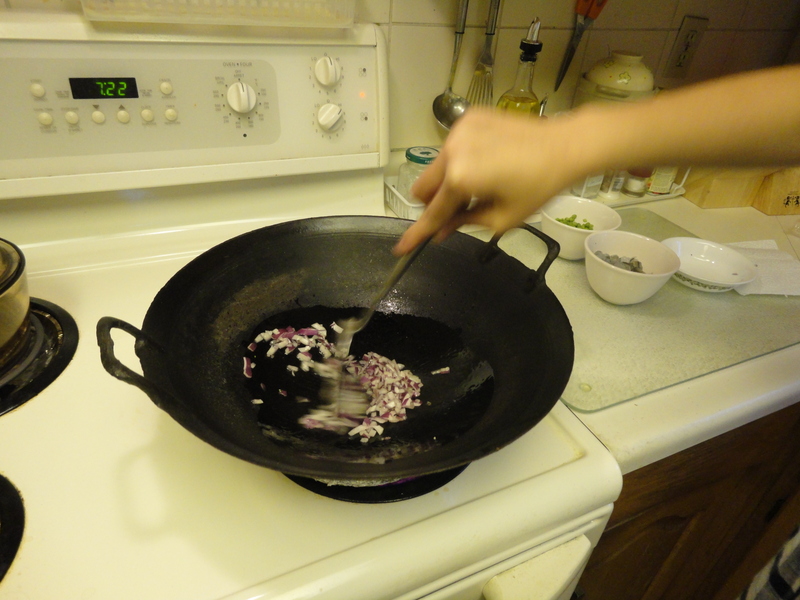 Last week, I got my mom to show me how to make zhongzi. A labourious but delicious food in Chinese culinary tradition which consists of glutinous rice and sweet or salty fillings wrapped in big bamboo leaves then boiled or steamed for several hours to cook. I won’t tell you the origins of why we eat zhongzi or give a recipe, those can be found a plenty on the Internet. Because of the wide diversity of ingredients and methods for making zhongzi, I wouldn’t want to give a recipe anyway. Even the shape of how they are wrapped varies depending on which region! Regardless, I thought I’d show you how my mom and I did ours. 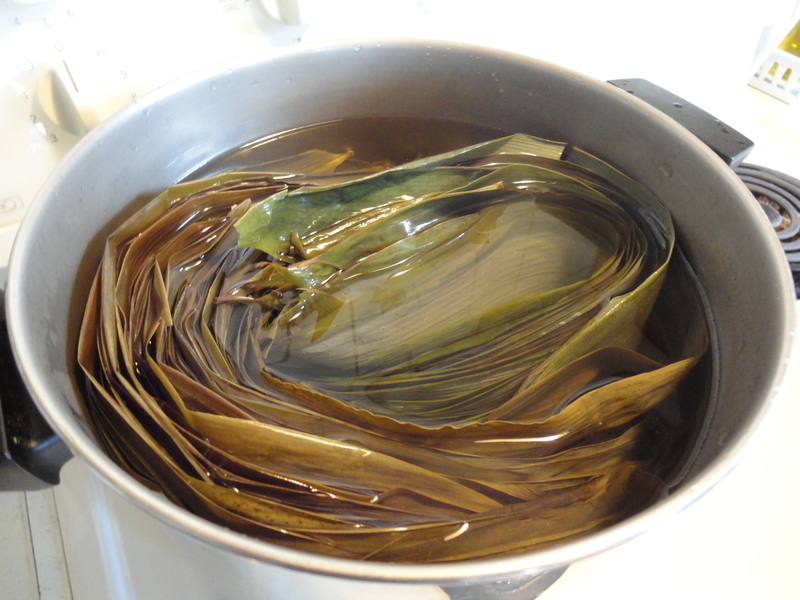 No matter what your zhongzi looks or tastes like, first and foremost is the preparation of the bamboo leaves. The leaves can be bought across Chinatown, generally in the herbal shops, though you won’t need to search for them when it’s zhongzi season as they will be displayed right out front. When shopping for leaves, look for big thick leaves free of any rips or damages. Some people find it easier to wrap with small leaves. To prepare the leaves, they need to be soaked overnight, then boiled and drained, then some people soak them again. My mom even brushes each leaf to make sure they’re clean and malleable. When the leaves are wet, you get a taste of that aromatic tea smell that will help flavour the rice of the zhongzi. 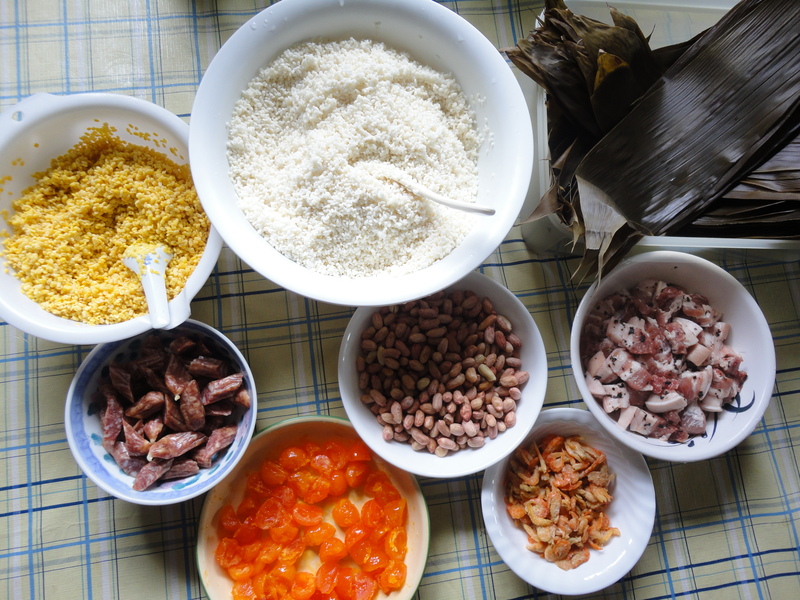 Our fillings included glutinous rice, fatty pork, Chinese sausage, salty duck egg yolk, dried shrimp and either peanuts or split yellow mung beans. Our fillings tend to be quite simple but you can put just about any filling you like from Shiitake mushrooms, chestnuts and bamboo shoots to fancy fillings such as dried scallops and abalone. The selection and preparation of the fillings is where you find a big divergence in how the zhongzi is made. Some use rice where the individual grains can be seen after cooking, whereas some become a glutinous ball or wrapping around the filling. Some soak and season the rice first. Some cook the fillings first. Some marinate. You get the idea. Next comes the wrapping part. Again, the size and shape varies based on preference and region. They can be flat and rectangular, long and cylindrical, short and pyramidal. Here’s how my family wraps our zhongzi. 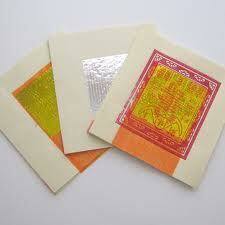 Wrapping zhongzi takes lots of practice and skill. Mine were pretty lop-sided =/ It also reminded me of when my sister and I went to China in 2010 and visited Zhou Zhuang, often called the “Venice of the East”, where there were food shops galore filled with small local eats. Zhongzi is abundant since it’s portable and compact and one elderly woman was catching lots of attention with her impressive zhongzi wrapping skills. And I shall leave you with that. Remember that if you want to participate in the community kitchen and learn how to cook traditional Chinese food, email me! d3chow@gmail.com or simply leave a comment here. Happy Eats! So this past weekend, my yenyen, sister and I attended the Hoy Ping Benevolent Association dinner and we met lots of people. Since there was a big audience (about 450 people) at the dinner, my sister and I decided to seize the moment and appeal to the young people in the room. We asked our good friend, the chairman of the Hoy Ping Association, to allot some time for us to go on stage and speak to the crowd. Although the room was loud and not too many people were listening, we had a rare opportunity to chat with NDP-MLA Jenny Kwan, Vancouver City Councillor Raymond Louie and Councillor Kerry Jang. I also hung out with the association’s Kung Fu club as they showed a great slideshow of the team’s part in the Chinatown Parade back in January. And it seemed our appearance on stage worked. In the last 15 minutes of the dinner, Janet approached our table to chat! Thanks Janet! This recipe is the first Chinese dish I ever learned to make. When we were growing up, my mom would go play mahjong on the weekends (and as you probably know, serious mahjong games run for at least 4 hours) and had to make a quick meal for us before she left and it was often BBQ fried rice. Aside from the BBQ pork, all the other ingredients are already often found in most Chinese kitchens, or at least ours anyway. These days, fried rice has entered the realm of westernized Chinese food, being lumped into the same camp as sweet and sour pork, chicken chow mein and egg rolls, but not so! Fried/sticky rice is served at big banquet meals, albeit at the end. At more formal dinners, rice and/or noodles is served at the end as a filler after you’ve enjoyed the real dishes of sea cucumber, crab, duck etc. So, this dish can be made in a snap for a quick meal, like I did last night, or to accompany a formal dinner. 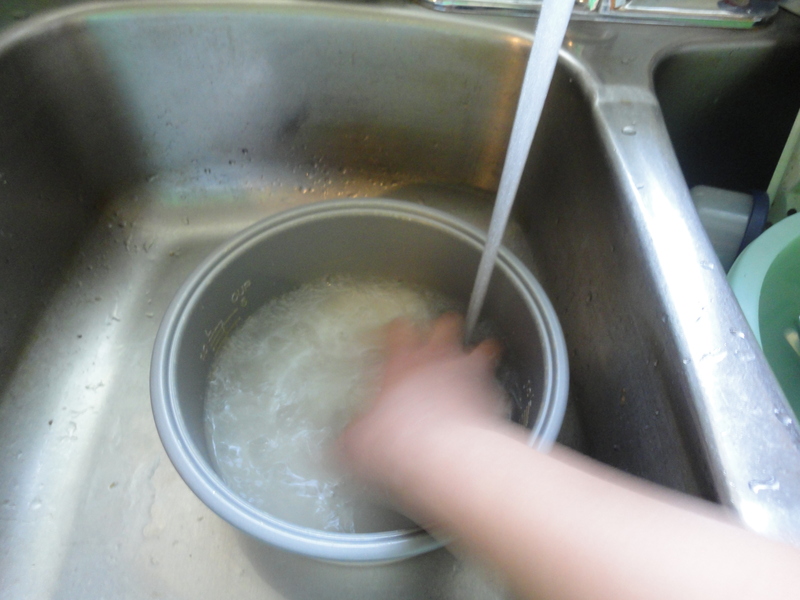 Wash 2 cups of rice in cold water and cook. 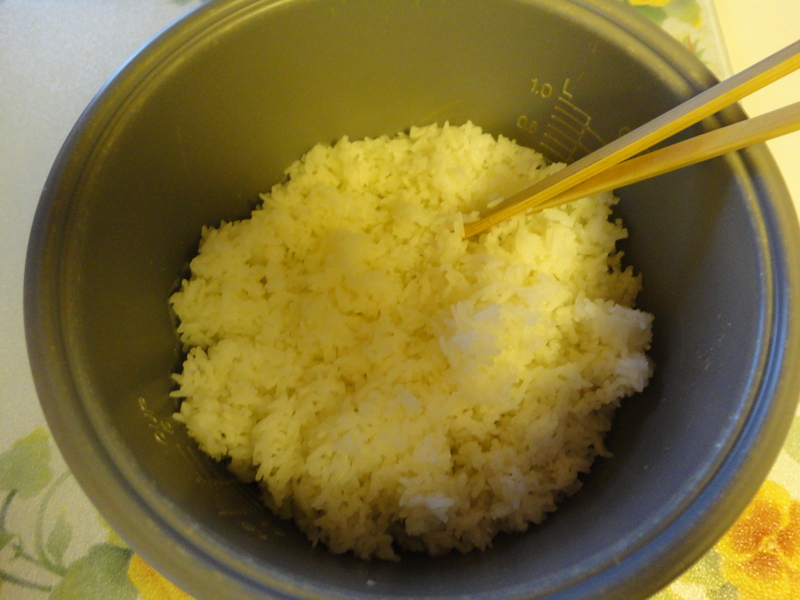 The most common way to cook rice these days is in a rice cooker, but if you have a ceramic pot, it supposedly tastes better, you would just have to time it. 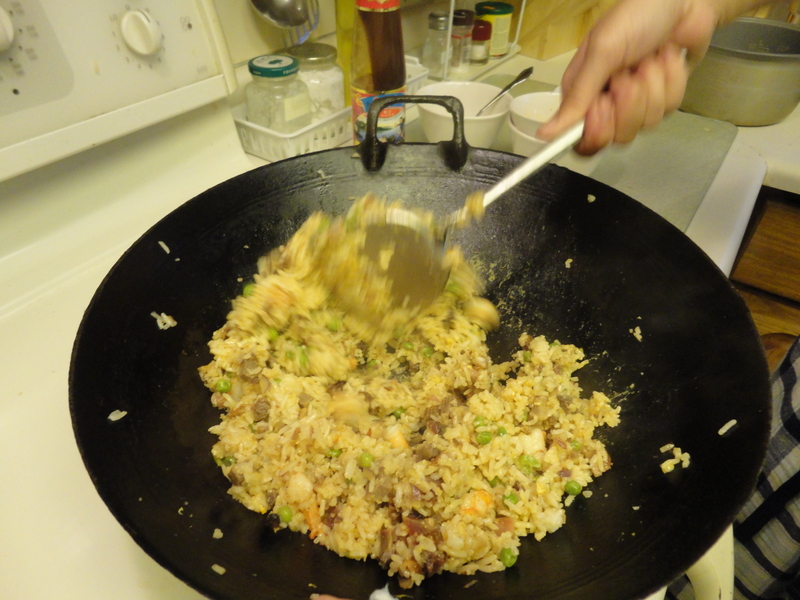 For fried rice, the best is actually to use old rice because freshly cooked rice sticks together. If you’re using freshly cooked rice, make it as early as possible, then fluff with chopsticks and cool the rice for as long as possible. While the rice is cooking and cooling, defrost the frozen peas and tiger prawns, I just do this in a bowl of water and it doesn’t have to be completely defrosted, just enough so there’s no ice and they’re free. Dice the onion/shallot/scallions, whichever you’re using, and the BBQ pork. 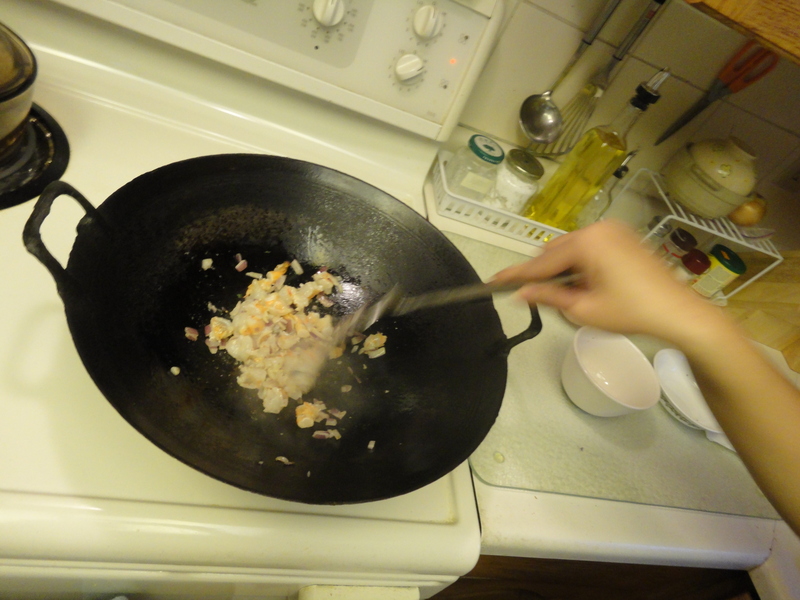 Once the prawns are defrosted, drain the water then peel and cut into 1/2-1 inch pieces. Drain the peas once they are defrosted. Set up all your ingredients so they’re convenient as you’re cooking. 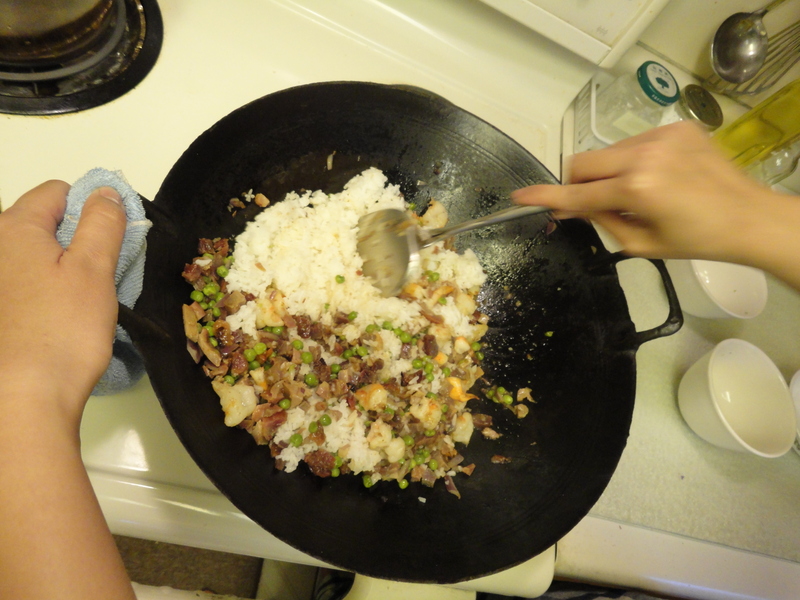 Once the rice is cooled and ready to go, take out your wok. 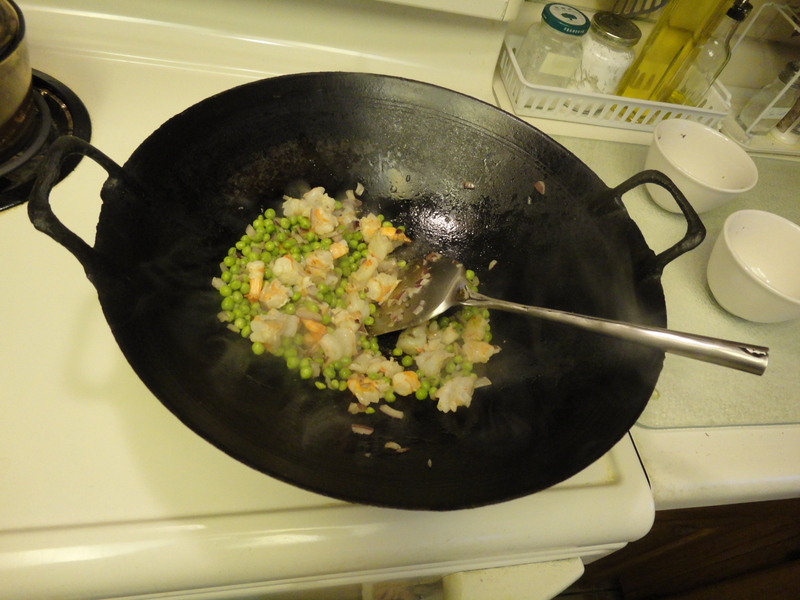 Ideally you use a wok since it’s superior to the frying pan due to it’s size, efficiency and versatility, but if a frying pan is all you’ve got, it’ll do. Just use the largest once you’ve got. 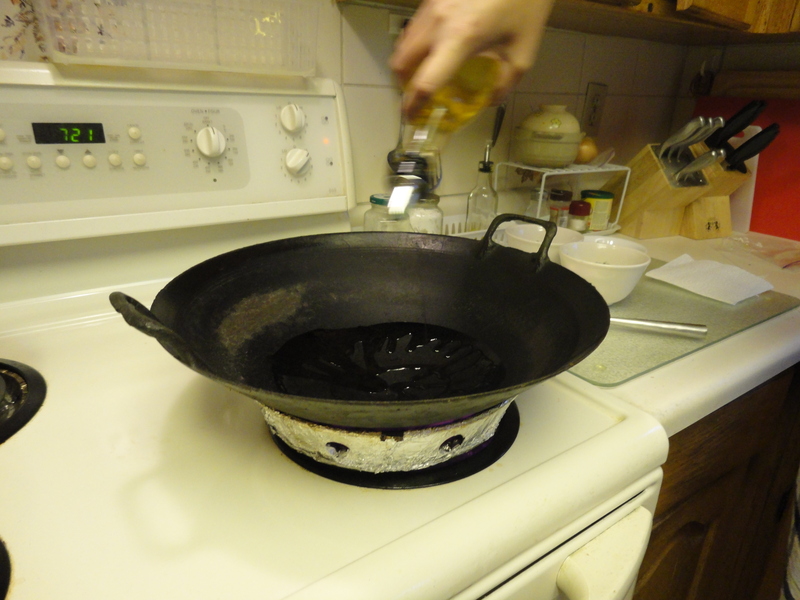 Heat the wok and oil over high heat. 1. Onions – cook until it smells so good you’re tempted to reach into the wok with your bare hands for a taste… or until slightly golden. 2. Tiger prawns – prawns are cooked once they turn orange. DON’T cook them all the way or they will be tough and stringy by the time you’re done. 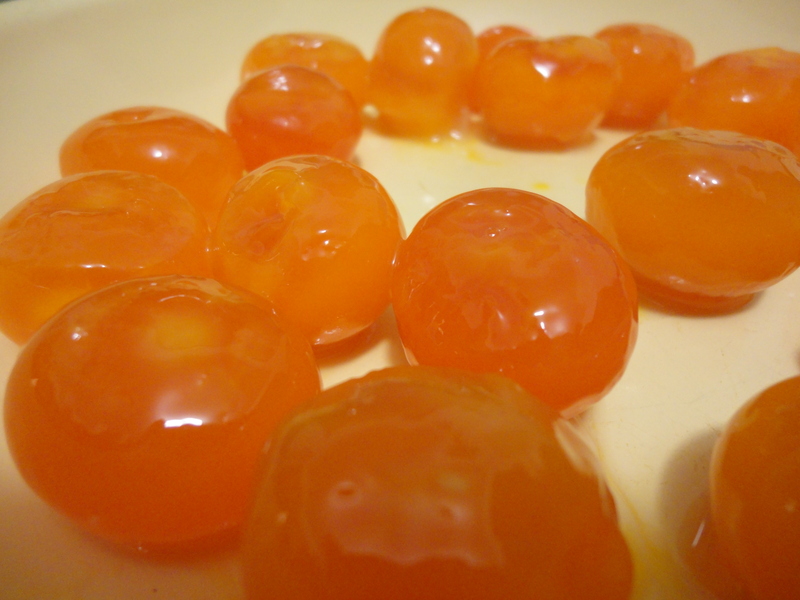 Cook them until you start to see some orange. 3 & 4. 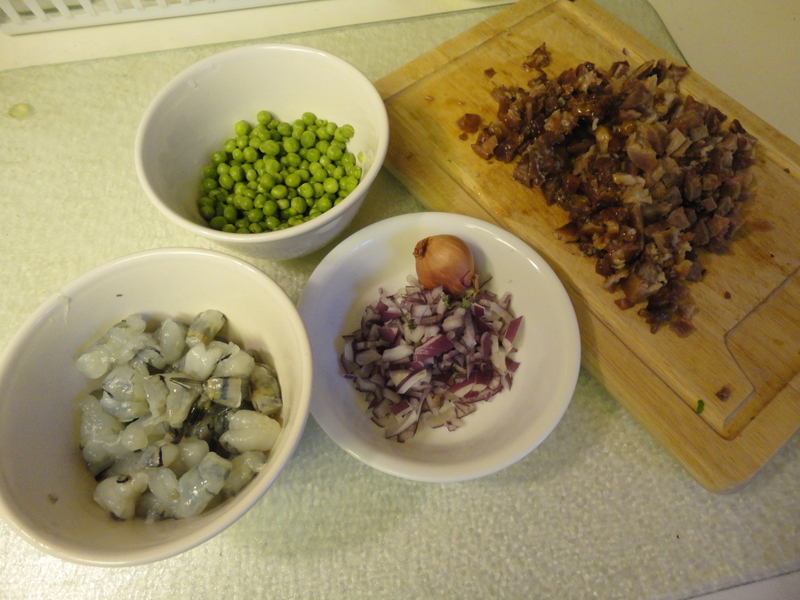 Peas & BBQ pork – just toss ’em around so they heat up and the flavours of each ingredient are distributed. After a while, you may begin to notice that the bottom of the wok is sticking, this is because of the sugar from the BBQ pork burning. Turn down the heat to med-high. My idea of med-high is 7-8. 5. 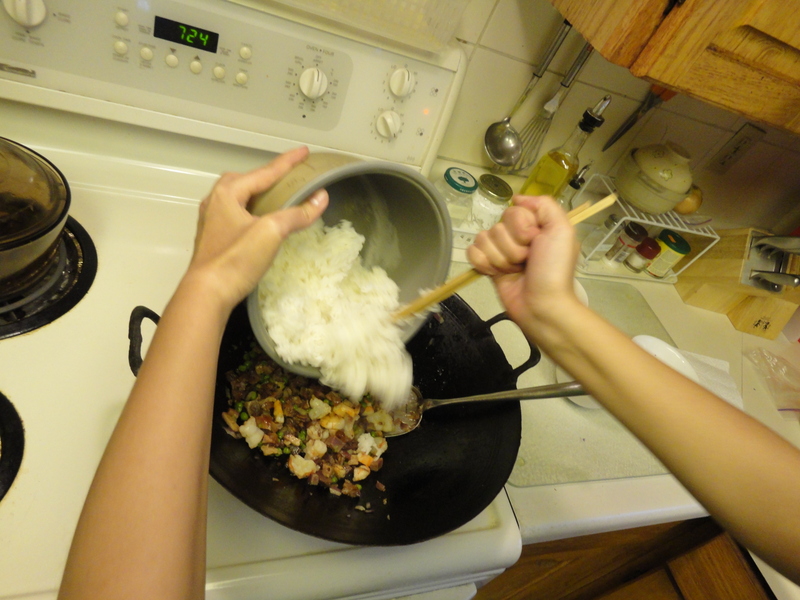 Rice – dump all the rice into the wok and using the blade of your spatula, break up any clumps. 6. 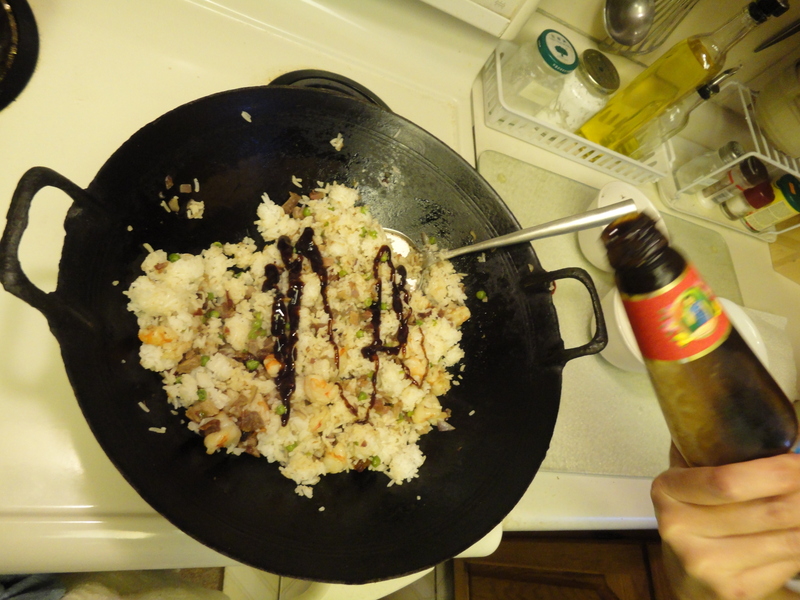 Hoisen Sauce – drizzle over top and toss until the sauce is evenly distributed. 7. 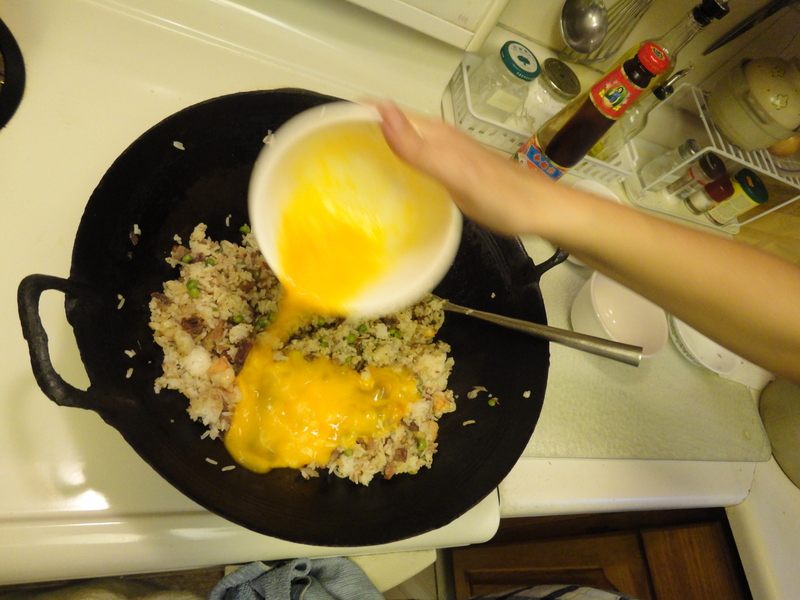 Egg – this is the part that makes it fried rice and is the last step. Pour the egg over top and toss vigorously. If you let it sit for too long, the egg travels to the bottom of the wok and cooks by itself, resulting in scrambled eggs. What you want is for the rice to be coated in egg. Keep tossing until the egg is cooked and the rice doesn’t look wet with raw egg. This is the first time I’ve ever taken pictures while cooking and giving directions for it so feedback is welcomed and strongly encouraged! Also, if you try the recipe out, please let me know what you thought of it, or if you made any modifications. I’d be happy to hear from you! 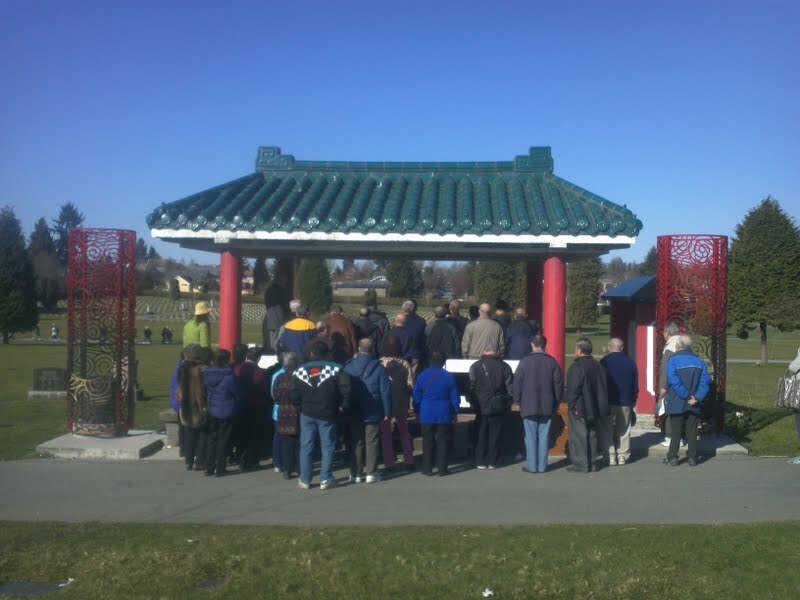 Thanks to the great sunny weekend, the Qingming kickoff at Mountain View Cemetery went smoothly. The ceremonies performed by different Chinese Benevolent Associations were held at the Chinese Pavilion. 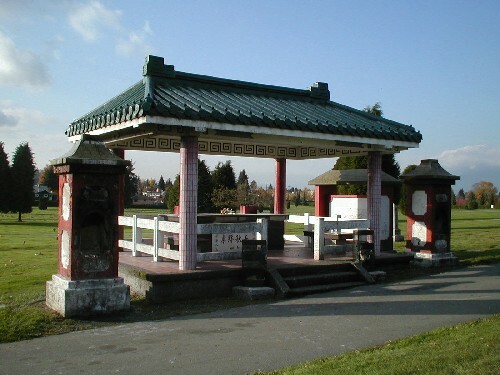 And thanks to The Chinese Benevolent Association, the Lotus Light Charity Society, the PTT Buddhist Society and the City of Vancouver, two new 10ft. tall ceremonial burners were unveiled May 2nd, 2010, replacing burners that were built in 1901. Here’s a video of the unveiling of the new burners on May 2nd, 2010. Ceremonial burners in Chinese culture are used to burn offerings to our ancestors in the afterlife. 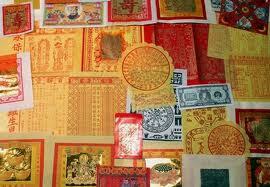 The offerings come in the form of joss paper, thin bamboo or rice paper that is white or yellow usually with red printings and/or gold foil. 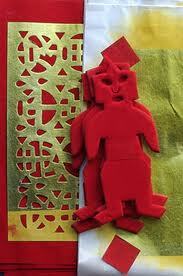 Sometimes is made to look like money or back in the day, cut out like a person to represent the offering of a servant. If you’ve ever walked into a knick-knack store in Chinatown, you’ve probably seen it. There is also lots of food involved in the ceremony. Chicken, eggs, fruit, pastries, rice cake, sweets, liquor and roast pork. 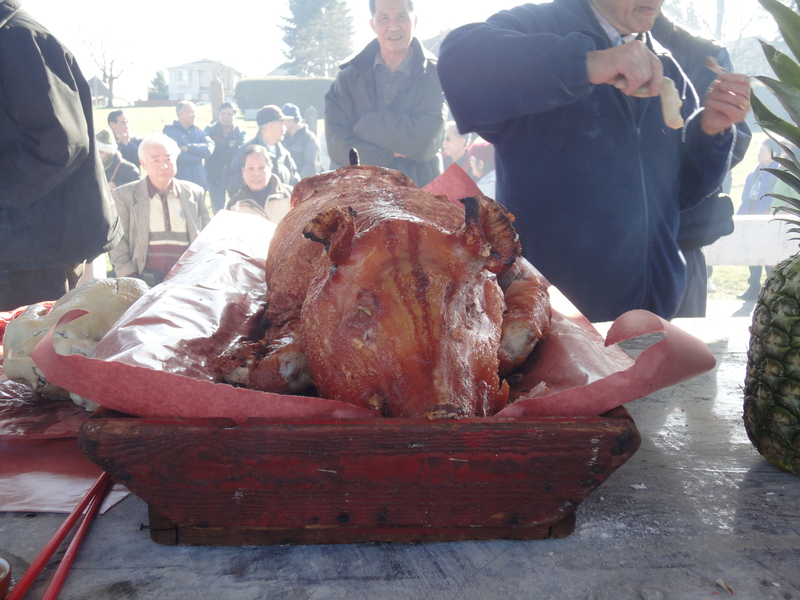 A whole roast pig in the case of very large groups and firecrackers are lit to ward off evil spirits. It was great to see everything in action on Sunday. Here are some shots. 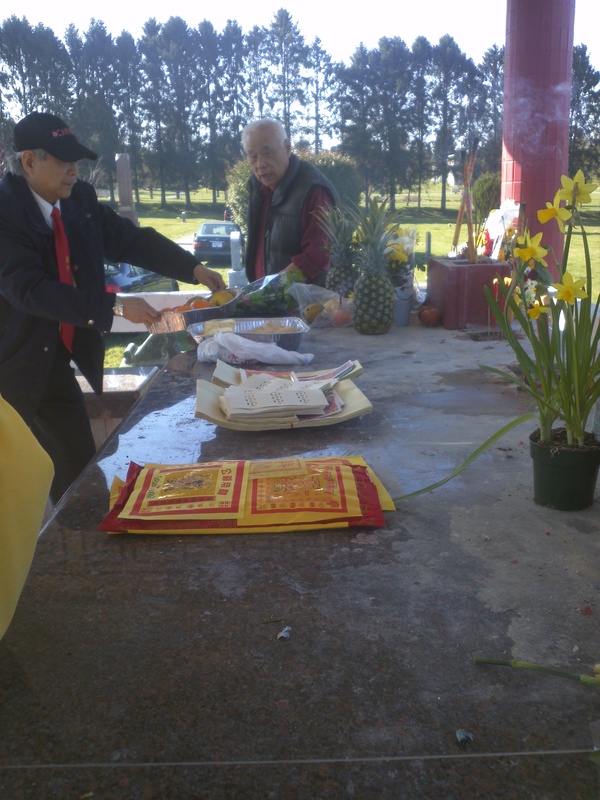 The Hoy Ping Benevolent Association Chairman setting out the fruit and joss paper for the ceremony. The crowd gathering around the pavilion for the ceremony. 2 roast pig offerings, incense and candles. 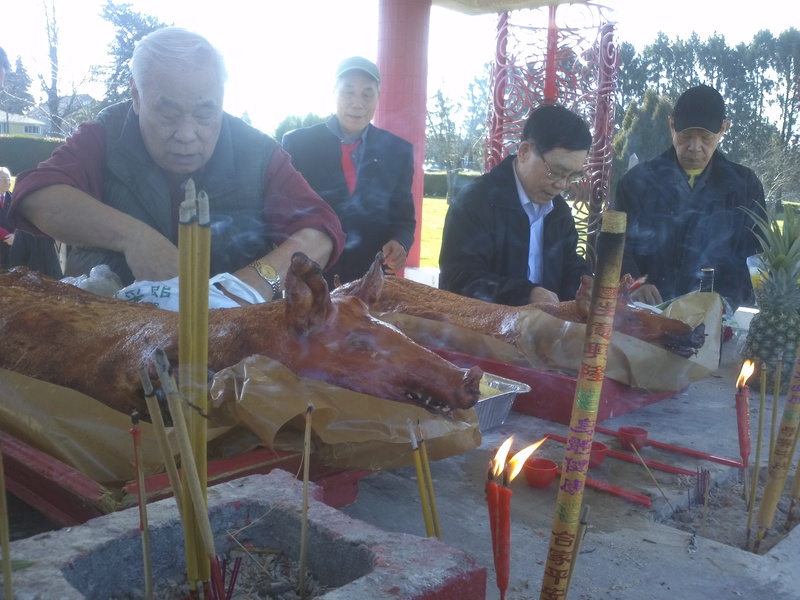 Members of other associations began eating some of the offerings to be one with their ancestors. After everything was done at Mountain View, we went back to the benevolent association headquarters to eat and commence our AGM. Though the festivities were joyful, the AGMs have been a downer for members. Aside from my sister and I, there was only one other person in the room who was in their 30’s, of a crowd of about 200. The next youngest was 48. And this is not a problem that is particular to the Hoy Ping Benevolent Association, it is a problem for Chinatown as a whole. I spoke with the other two young people and we all agreed, if the problem persists, the association will very likely die without younger people getting involved. What do you think would attract younger CBCs? What kind of activities do younger people like to do? What would you like to see happen in Chinatown? Another Cooking Class at HPBA. The theme: Eggs!